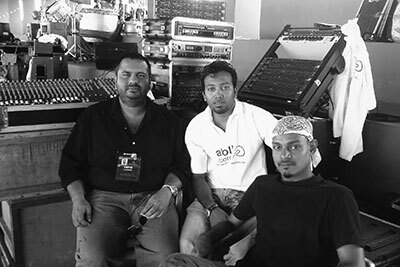 I was called to engineer the sound at Collina for Tsunami Victims held on the 7th of January 2007 at the National Stadium, Male’, Maldives. The event was organized by Haveeru Daily and was broadcast live on TV, radio and on web stream. A mixed line-up from Atoll Records performed two songs – one a theme song for the event and “Mithuraa”. Two percussionists played a Band Bass Drum and a small snare along with Chinese Drums in the theme song. I had to use gated compressors to clean them up for the mix as there wasn’t a clear definition of tone in the Chinese Drums. As always, I spent a great deal of time cleaning up the tones from the source, for example, from the amps, before the mix. I had to call in extra help because, the band was setup on the steps of the stadium and we couldn’t run our snake in front of the house. Also, Hambe was on the drums this time and not behind the stage. After a bit of brainstorming on who could understand what I say on the two-way radio, I decided on Fasy.